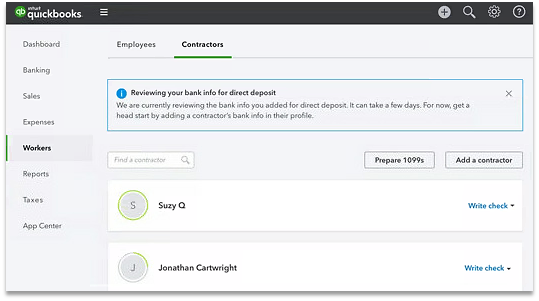 With an active payroll subscription, customers can pay contractors via direct deposit. I have a QuickBooks Online account. Will I be able to use this feature? 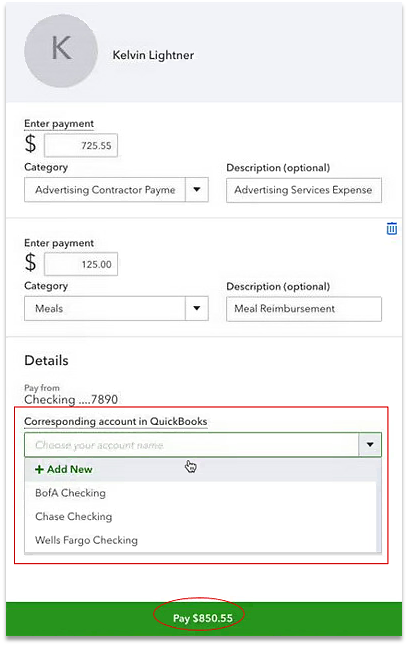 You will need to subscribe to QuickBooks Online Payroll or QuickBooks Full Service Payroll to use this feature. Note: If you have an inactive W-2 employees or no employees at all, you will still need to have a subscription to pay contractors with direct deposit. Can I set up a different funding bank account to pay contractors? No, you can only use one bank account for all direct deposit transactions. I have a payroll subscription but it's not active active for direct deposit. Do I need to turn it on first? Yes, you need to complete the direct deposit setup before you can use this feature. Where do I view my transactions? Select the transaction that you want to view. How to print a pay stub after paying contractors using direct deposit? Select the contractor/vendor that you want to view. Under the Transaction No field, select the transaction that display DD. Note: We do NOT support direct deposit deductions for contractors such as deduction for cash repayment. How much does this feature cost? On top of your monthly payroll subscription, an additional surcharge will be added to your billing. This per-contractor, per month fee is the same as the per active employee fee in your QuickBooks Online Payroll or QuickBooks Full Service Payroll subscription. You're able to issue as many direct deposit payments to a contractor as needed with just this flat fee. Do I have to switch the contractor status to inactive for me not to get changed? No, our system will be able to identify if you have run a direct deposit payment for that contractor. I created a contractor direct deposit but deleted it. Will I be charged for the deleted transaction? No, you will only be charged if you have run direct deposit payments for you contractors. What if I'm still charged even if I did not run direct deposit payment for that contractor? Contact Payroll Support for assistance at 888 - 537 - 7794. If a client is on our wholesale billing, can they activate direct deposit? And charge it to my account without my involvement? That is a possibility. Please be sure to review this feature with your clients. Determine if they are interested in using it before incurring any fees. Can I void the contractor direct deposit? No, if the payment has been processed. Yes, if the payment is still pending. If the contractor direct deposit is already processed, how do I void it? You need to create a journal entry to void this transaction. Do contractors receive their direct deposit the same day I approve the payroll? No, same day direct deposit is not available for this feature yet. When will the money be taken out of my funding bank account? The funds will be taken out of your bank account the day before the pay date, after 5:00 pm, PST. When will contractors see the funds in their account? Contractor direct deposit scheduled to post the next business day before 5 pm of your local time. Unless your direct deposit lead time is set to five business days. Do customers and contractors receive direct deposit payment email confirmation? Can we resend email confirmation? Contact customer support for assistance. Will there be an indicator showing the payment was processed through direct deposit? Yes, the Transaction No field will display DD on the expense record, if the transaction was made via direct deposit. Can I use the mobile app in creating a contractor Direct Deposit? 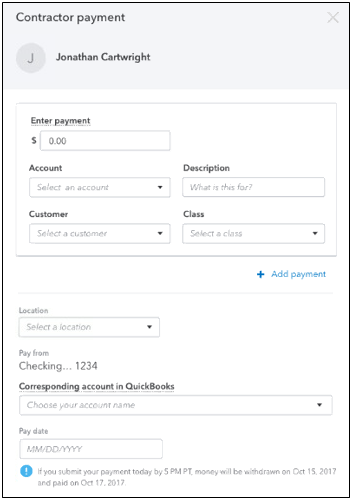 No, at this time you must be using a desktop browser with QuickBooks Online to create contractor direct deposits. Will the entry be duplicated with the bank download? When a contractor is paid it will reflect in the check register. When downloading transactions from your bank, we will attempt to match the transaction. There remains the possibility that if it is not matched, a duplication could occur. Can I enter a project, class or customer when paying a contractor? Yes. 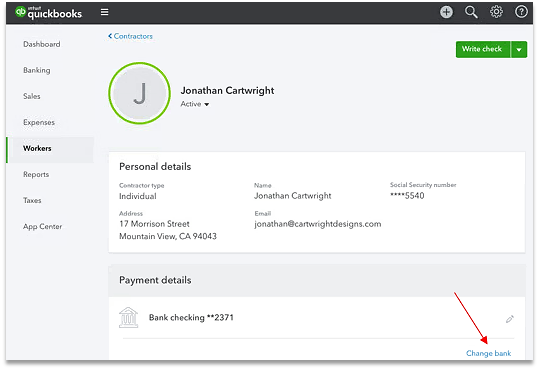 You now have the ability t enter a project, class or customer when creating a contractor direct deposit. If the contractor has emailed you an invoice, how do you correlate the invoice to the payment? At this point we do not support file attachments for direct deposit payments. 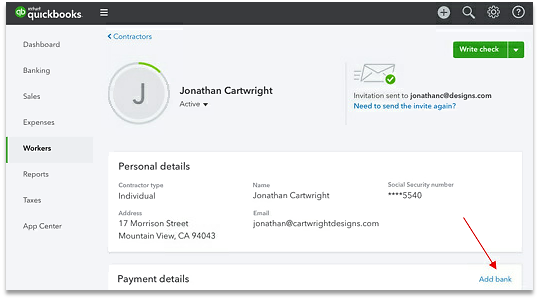 In the future, we will work on the ability for employers to attach an invoice to a payment record. Can you use products and services, then assign to a job? At this time we do not support this capability in contractor direct deposit. How to apply a direct deposit expense to a vendor bill? Select a vendor and the desired direct deposit expense from the Transaction List. Under Add to Expense, select Add. Add the amount of the DD expense and select Save. Review the changes in Amount to Apply and Amount to Credit. Then Save and close. The customer's open balance will be reduced. I want to activate direct deposit. Where do I enter my funding bank account information? See Enroll in direct deposit (DD) for more details. Under the price select Get Started. Select Set up direct deposit. Select Add bank. Enter your banking credentials or bank account information. After entering bank information, a test transaction must be entered to verify bank account on file. If a bank account was connected with your banking credentials, you will not see this prompt. Can contractors enter their own bank information? How? Yes. See the steps here for assistance. How do I change a contractor's bank account? In the contractor's profile, select Change bank under Payment details. After updating the bank information select Save. How do I set up my contractors for direct deposit payment? Note: The drop-down for Pay with direct deposit will show if bank account is already added to contractor's profile. Enter contractor's bank account information, then choose Save. How do I create a contractor direct deposit payment? Choose Write check from the drop-down on the contractor's name that you would like to pay, then select Pay by Direct deposit. Note: If you have already setup for direct deposit, Pay by direct deposit will be your default option. Enter the needed information, then select a Category for the payment. 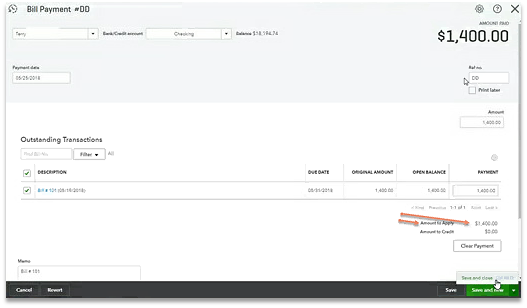 Select a Corresponding account in QuickBooks. Note: This is the account inside your chart of accounts that this transaction will post to. Not the account we will debit from. This account must be classified as a Checking account in QuickBooks Online. Select Pay beside the total amount. A confirmation message will pop up, then select Yes, let's proceed to confirm payment. Contractor payment details will show, then select Close.